Mini Orange and Cranberry breakfast muffins topped with a chocolate heart from yesterday, strawberry hearts and a peanut butter and jelly heart pocket with chocolate decorations. 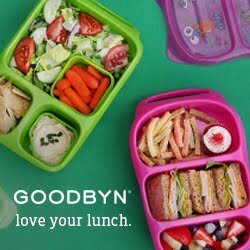 I added Lunchbox Love Cards of course to make this lunch extra special ! We also packed our yumbox again. Today we packed a Chobani Champions Strawberry tube with chocolate decorations, strawberry hearts, carrots with a big apple heart, mini sandwiches and a cereal yogurt bar. Cute! I love the hearts & the XOs!! Thanks for sharing this at my Pin Me Linky Party.